secure settings for each workstation. Add user-created images to personalize the 'look' or highlight events. Prices are in US dollars. Shipping charges and Sales Tax may be added. Prices subject to change without notice. 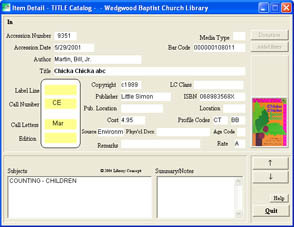 CONCEPT I adds many extended features to the original PC Card Catalog, a library automation software system known for its reliability, ease of use and value. CONCEPT I contains all of the features in the highly regarded Basic and Circulation modules. Current users will feel at home in the friendly "browse" style catalog with its 'closest-guess' responses and intuitive AACR2 (traditional card catalog) search order. But for the Google® folks CONCEPT I's Word Search catalog adds the power of 'casual Boolean' searches. Users have access to materials from every conceivable view. CONCEPT I maintains check out history data. 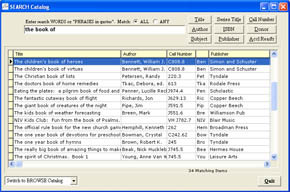 This information can provide the library staff with details such as a patron's reading history or who might be responsible for damage to an item. Include a custom background image to personalize the look of the screen. Use the school mascot, an art design, something whimsical or elegant. Change backgrounds to highlight holidays and events or to promote library services. Accelerated Reader® Program details are highlighted in the CONCEPT I catalogs and printed lists. 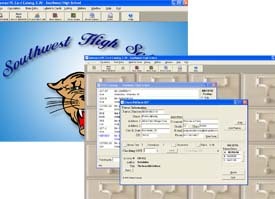 CONCEPT I OPAC includes a selection of 'skins' to create contemporary, elegant screens. Select from four including an industrial strength "brushed metal" or a relaxing "southwest" look. CONCEPT I OPAC gives patrons the capability of unattended Check Out and personal status review. Patron ID and optional PIN assure security.